Just getting ready to order some Mitchells soap and looking for others that help with dry skin. Mistral has nice soaps. I particularly like their black amber soap. Mike's is great, also like Tim's Soaps. I've been using Cussons Imperial Leather for most of my life and it remains my go-to bath soap. Better yet, SWMBO likes it as much as I do. Neither of us, however, took to Mitchell's Wool Fat bath soap. I buy from https://www.etsy.com/shop/sweetcreekherbalcare . Good Earth Spa - both Dragon's Blood and Sandalwood soaps. She sells 10 bars for $30 delivered. I have been using it for a couple years and no longer get dry skin like I did with the commercial stuff. All I have used for the past year + are Stirling bath soaps. I currently use this bath soap, and the scent is amazing and the lather it creates is really thick and moist at the same time. Not drying at all. Did I mention the scnet is fantastic !! I noticed Klar made hand soaps as well. Looks like I will be making another order at Gifts and Care. BULLGOOSE carries a nice selection with many from familiar shaving soap and cream makers. It's always been fun to try a few to round out an order. (02-19-2016, 02:13 PM)Cincinnatus Wrote: Good Earth Spa - both Dragon's Blood and Sandalwood soaps. She sells 10 bars for $30 delivered. Very cool website and TONS of options. I take it you have been happy with these? One of the best bargains is Pre de Provence No. 63, as it's a very large 200g bar, is quad milled so that it lasts forever, and has a knockout warm, spicy, masculine scent, for only $6.99. It's great. 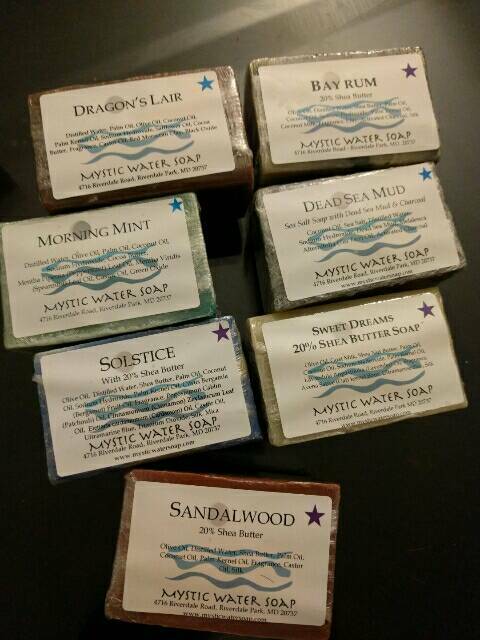 I got a boat load of bath soaps from Mystic Water when she had a clearance sale recently. I'll update this post with a picture tonight. There are a lot of good soaps available, but if cost is not a consideration, then there's hardly anything better than the Penhaligon's bath soaps. i have been known to use shaving soap to bathe with. i even wash my hair with it. of course, i only use what i can get locally. i can get williams and VDH locally. any of the good stuff i order stays for shaving. Check your favorite artisan's Web site. Many have also sell bath soaps. We actually started making bath soaps and moved into shaving soaps when I started DE shaving. I personally prefer artisan bath soaps because many are actual soap - i.e., they don't use detergents like SLS. My skin doesn't like SLS.